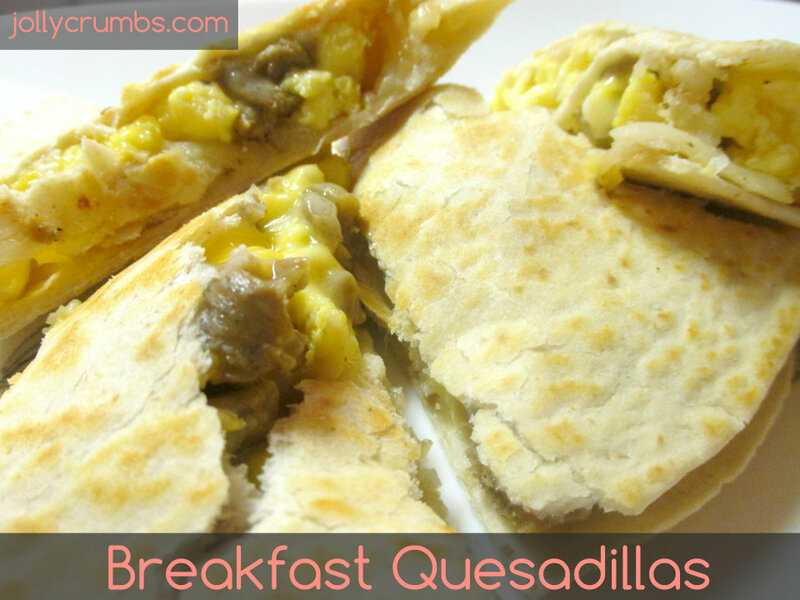 I love, love, love these quesadillas! I have no idea why I never made breakfast quesadillas before. 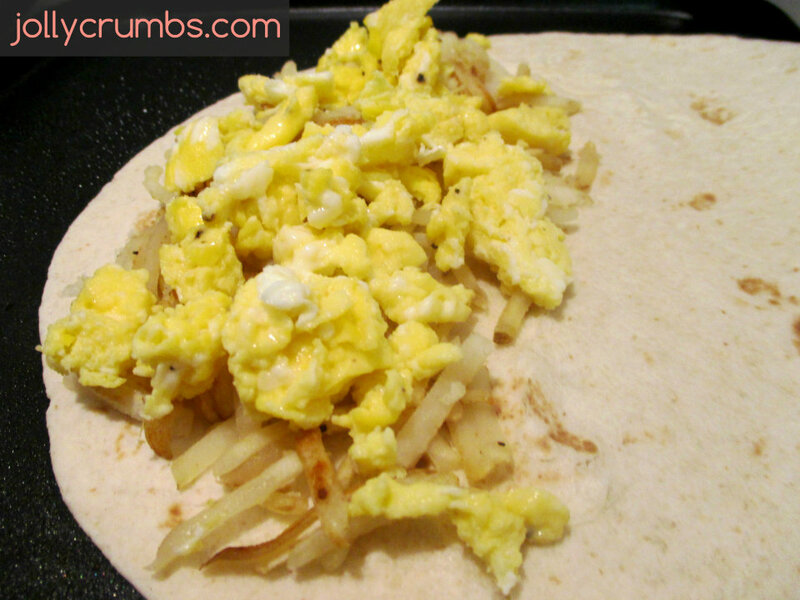 I love breakfast burritos, which are a relative to the quesadilla. These were incredibly easy to make. I have to tell you, these are delicious. The crunchy shell of the tortilla combined with the warm, melty ingredients inside the quesadilla are perfect together. 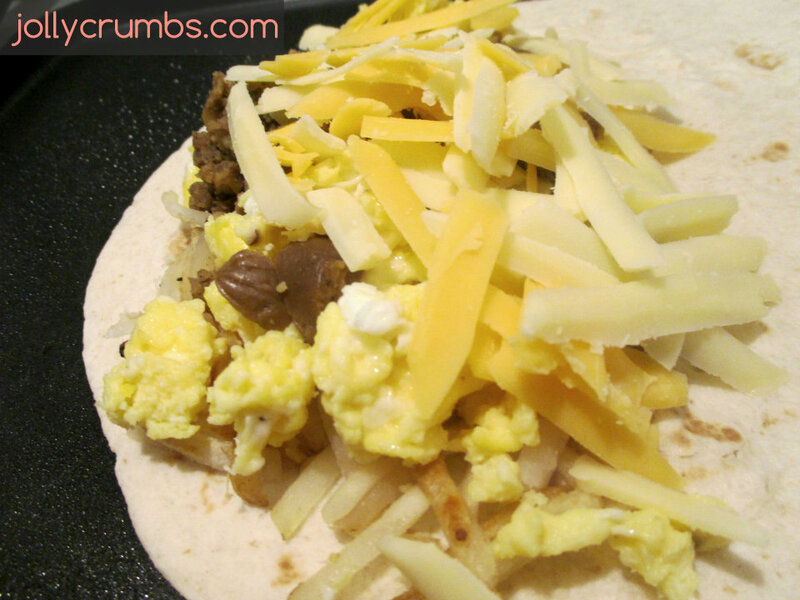 I also love this recipe, or idea, because it allows Samuel to add meat to his quesadilla. I don’t ever cook with meat. These quesadillas allowed him to add sausage to his portion, and mine were happily meat-free. So, these are absolutely perfect for customizing to what you want in your own dish. If you like tomatoes and someone else doesn’t, you can add those to yours. I’ll go through what I did to make my quesadillas, but you can make these however you choose. First, I heated up a pan with some nonstick vegetable spray for the hash browns. I used all natural shredded, frozen hash browns. Once the pan was hot, I added the hash browns and cooked them unil they were golden brown. Next, I scrambled eggs. I used whole, large eggs for this, but liquid egg whites would work well too. I mixed eggs together with a splash of milk and whisked them together before adding them to a hot skillet. I use a spatula and scramble my eggs until they are soft and fluffy. Make sure to remove the cooked ingredients from the stove so they do not continue to cook. They will be warmed through when you actually make the quesadillas. Next, I shredded my cheese. I used extra sharp cheddar and extra sharp white cheddar. I love bold cheeses in breakfast foods because they hold up well against other strong flavors. A bonus is that you can use less of these cheeses because of their strong flavor. I added a chopped vegetarian sausage link to my quesadilla. Samuel added actual sausage to his. You can add proteins or veggies to yours. Whatever you choose to add, make sure you cook it thoroughly before adding it to the quesadilla. I prefer cooked vegetables in my breakfast foods, but do whatever you love! When your ingredients are all prepped, cooked, and ready to go, you can assemble your quesadilla. I chose to use one large tortilla and fold it in half for my quesadilla. Samuel placed one tortilla on the bottom and one on the top to make his. It is totally up to you which way you want to make your quesadilla. I heated my griddle pan on the stove and sprayed it with nonstick vegetable oil spray. Once it was hot, I added a little cheese, hash browns, eggs, sausage, and the rest of my cheese to half of my quesadilla. I folded the empty half over to top the quesadilla. I waited until the cheese had melted some, and then I sprayed the top tortilla shell with nonstick spray and flipped it. I grilled it until it was golden and crispy. I’m sad I haven’t come across this idea until now. I’ve lived my life up to this point without a breakfast quesadilla. If you have also suffered the same injustice, you have got to make these. They are perfect. You can add in whatever you love, and you can always change up the ingredients to fit your cravings. Sautéed onions will likely make an appearance in my quesadilla next time. You can even make the filling ingredients ahead of time and assemble the quesadillas when you are hungry. Seriously, I love everything about these. I am definitely making more in the future. Cook all of the ingredients you are using before making quesadilla (except for tortillas). You do not have to keep cooked foods warm because they will warm up when you make the quesadilla. Once your ingredients are cooked, place a tortilla into a hot pan that has been sprayed with nonstick cooking spray, butter, margarine, or oil. Add in the cooked ingredients on top of the tortilla. Place another tortilla on top, or use my fold over method which I discuss above. Once the bottom tortilla has become crispy and golden, spray the top tortilla with nonstick cooking spray, butter, margarine, or oil. Flip quesadilla so the other tortilla can become crisp and golden. When done, cut quesadilla with a pizza cutter or sharp knife so you have wedges. I cooked all of my foods before assembling the quesadillas. You can cook your ingredients ahead of time and store them in the refrigerator.